When most people think of archaeology, the picture that comes to mind is more-often-than-not one closer to that of Indiana Jones than to that of Lara Croft. Despite both characters existing on a fictional spectrum, this observation of how such popular media culture is represented and absorbed by the general public is an example of a much bigger problem within the field of archaeology itself: androcentrism and the male bias. A mask of copper, a symbol of status, found near the skull of one of the Moche priestess-queens. 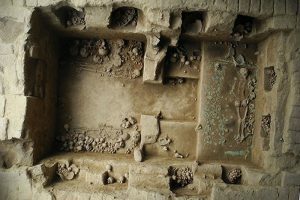 Excavations of the Moche civilization in San José de Moro, Peru that inhabited the area between 1 CE and 800 CE have been taking place for decades. But in the past 27 years, up to eight notable tombs have been discovered in what was once thought of as a society consisting of only male warriors, priests, and kings. Tomb after tomb, archaeologists’ preconceived notions of the civilization’s societal composition were put to the test and quickly fell apart. 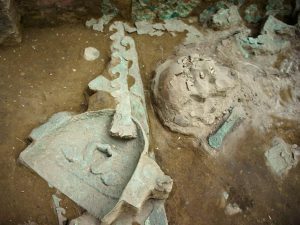 In 2006, archaeologists were shocked to come across a lavishly decorated tomb on the El Brujo site filled with the remains of—you guessed it—a woman. 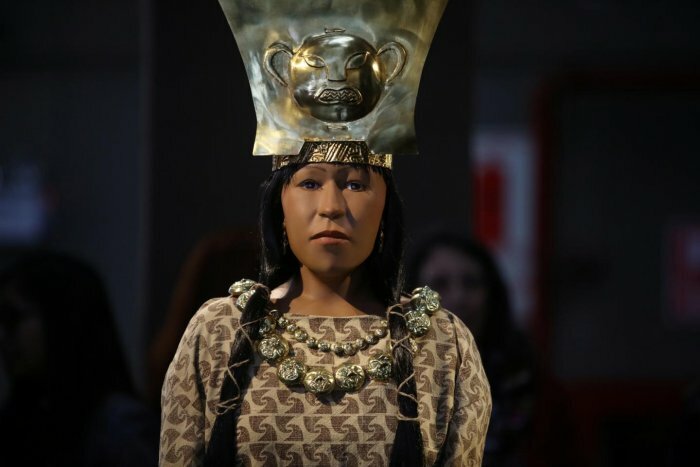 The findings from a burial analysis of her mummified skeleton and the artifacts deposited in her grave—buried with wooden scepters wrapped in copper, a large crown with an image of a puma, and several tattoos symbolizing sacred figures including snakes, spiders, trees, and stars—led archaeologists to believe that she lived as a high priestess or even a queen of the Moche people. She was later referred to as the Lady of Cao, her burial’s discovery only to be followed by seven additional discoveries of other burial sites of women. The mummies adorned extravagant headdresses and beaded necklaces, were buried next to sacrificed victims, and were surrounded by grand artifacts including scepters and goblets that indicated that they, too, were of higher status and had possessed a more prominent role in the Moche society. A reconstructed 3D-printed replica of the face of the Lady of Cao, a female priestess-queen of the Moche civilization. The impact of androcentrism in archaeology is thoroughly and explicitly exemplified in the long-held assumption by archaeologists that the Moche society was ruled only by male figures; with further analysis of the burial sites, findings implied that the buried Moche women belonged to a higher social class, further breaking the notion that the Moche civilization exclusively comprised of higher orders of men and, rather, included—or more often comprised of—women as social elites. 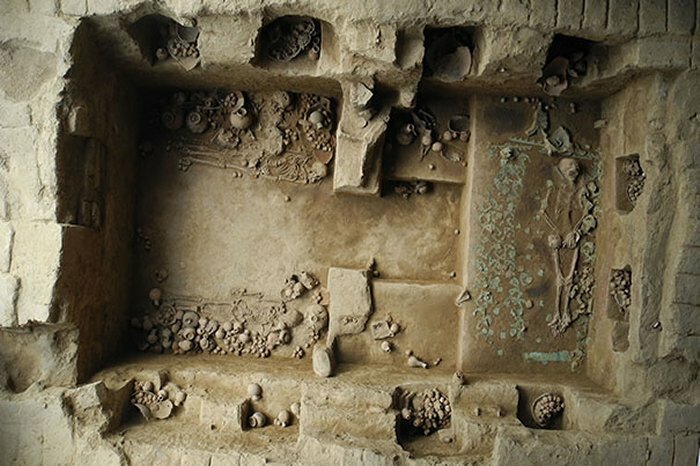 The tomb of the eighth Moche priestess to be discovered, buried 1,200 years ago with an array of artifacts that indicates her high social status. The discoveries of the priestess-queens of the Moche remind us that we must stay aware of our presumptions and biases as they often bring us to incorrect conclusions. As archaeology is still developing when it comes to including, recognizing, and rewarding women, the male bias is especially important to keep in mind when considering historical archaeological conclusions about the role of gender in ancient societies and cultures. With an awareness of the biases of not only ourselves but also those of archaeologists before us, we can make sure that we are not discounting any potentialities on a matter of assumption or misinterpretation of evidence and that we are, instead, taking into consideration all possibilities in order to accurately restore the archaeological record. Renfrew, Colin, and Paul Bahn 2010 Archaeology Essentials. 2nd ed. Thames & Hudson, New York. Traditional methods of archaeology include on-ground exploration and using historical maps and records. Many of these methods have been replaced by or are now practiced in conjunction with newer technologies, such as LiDAR. LiDAR, which stands for Light Detection and Ranging, is a “remote sensing method that uses light in the form of a pulsed laser to measure ranges (variable distances) to the Earth. These light pulses—combined with other data recorded by the airborne system— generate precise, three-dimensional information about the shape of the Earth and its surface characteristics” (NOAA 2012). The most common platforms used for LiDAR surveys are helicopters and airplanes, and the LiDAR equipment is, in basic form, a laser, scanner, and GPS receiver (NOAA 2012). The data received by the LiDAR instrument measures the time it takes for the light pulses to return to the aircraft (Renfrew 2015). This information is then translated into an aerial map of landscapes archaeological features such as man-made structures. “It often appears that sites in more easily studied areas of the world–plains, sparse forests, or areas cleared in modern times—are larger and more complex than their tropical forest counterparts. Does this impression reflect the inability of ancient humans to create large, sustainable settlements in the tropics, or is it the result of incomplete investigations, hampered by the complications of working in a rainforest?”(Chase 2010). The LiDAR system can read through the thick forest canopies, revealing the features underneath, allowing archaeologists to analyze these structures and to identify potential activity areas that might warrant further excavation. This study was able to confirm that Caracol was a “low-density agricultural city encompassing some 70 square miles” (Chase 2010). The researchers’ previous data, documented through ground field work had recorded some features, but the LiDAR assisted them in documenting the site’s “entire communication and transportation infrastructure at its height during the Late Classic Period” (Chase 2010). Other sites where LiDAR has been exponentially valuable are those at Tikal in Guatemala and Calakmul in Mexico. LiDAR, however, does have a few drawbacks. It cannot record completely perishable structures and although it can distinguish features that are less than a foot in height, it is still not completely accurate and will always require further research and groundwork. The benefits of LiDAR, however, are invaluable in excavating archaeological sites and in allowing archaeologists to reconstruct ancient civilizations. Clynes, Tom. “Laser Scans Reveal Maya ‘Megalopolis’ Below Guatemalan Jungle.” National Geographic, National Geographic Society, 14 Feb. 2018, news.nationalgeographic.com/2018/02/maya-laser-lidar-guatemala-pacunam/. Loughran, Jack. “Lidar Used to Make 3D Model of the Amazon to Understand Drought Impact.” RSS, The Institution of Engineering and Technology, 13 June 2018, eandt.theiet.org/content/articles/2018/06/lidar-used-to-make-3d-model-of-the-amazon-to-understand-drought-impact/. Chase, Arlen F., et al. “Archaeology Magazine – Lasers in the Jungle – Archaeology Magazine Archive.” Who Were the Hopewell? – Archaeology Magazine Archive, Archaeological Institute of America, 2010, archive.archaeology.org/1007/etc/caracol.html. NOAA. “What Is LIDAR.” NOAA’s National Ocean Service, Department of Commerce, 1 Oct. 2012, oceanservice.noaa.gov/facts/lidar.html. Renfrew, Colin, and Paul G. Bahn. Archaeology Essentials: Theories, Methods, Practice. 2nd ed., Thames & Hudson, 2015. Landscapes have become a major concept in archaeology. More often than not, archaeologists must study today’s landscapes to fully understand how they were used in the past. 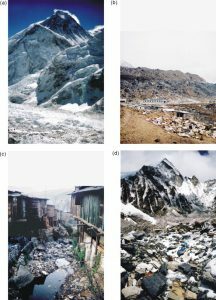 Archaeologists focus on landscapes, for “a landscape perspective can be used to address the built environment of cities, the physical layout of hinterlands, and the ways in which these distinctly shaped spaces would have been experienced by their inhabitants” (Smith, 2014). Landscapes are very important, for they hold valuable details of the people who once occupied the land. As archaeologists study these landscapes, they find a wide variety of artifacts, and features, depending on the region they are in. For instance, if an archeologist were to explore upstate New York, such as Kent, they would be expected to find various stone chambers. These chambers could lead an archaeologist to believe these features were once used to store objects, such as grain perhaps. However, one cannot simply infer this, and be sure they are correct. Therefore, it is important archeologists study the entirety of a landscape in order to find other objects that support their ideas. Unfortunately, archeologists do not just find artifacts from the past on these landscapes. More often than not, archaeologists encounter trash from those living today. This dumping of trash is very dangerous, for it is the beginning of a vicious cycle that depreciates the value of land immensely. In locations where there are loads of trash, most people tend to infer this land as flawed, or invaluable. For instance, a study was done by Beau Breza in the article, The aesthetic value of a mountain landscape: A study of the Mt. Everest Trek, to see what people viewed as valuable lands, versus displeasing. Participants were shown a variety of mountain landscapes and were told to rank them in an order which they found most aesthetically pleasing. After conducting the survey, it was clear the participants viewed the landscapes with more garbage as less valuable, despite the beauty underneath it (Beza, 2010). This is unfortunate, for in reality the value of land is based on what it could provide a population with, not the disrespect that has accumulated on its surface. However, once there is a noticeable amount of trash on a landscape, many people begin to believe it is acceptable to continue to trash these lands because they have already been deemed worthless. This is dangerous to archaeology, for trash hinders what details archeologists are able to uncover about the populations that previously inhabited these lands. Once a group disrupts a landscape, the untold stories of that land can almost never be retrieved. Thus, it is important to keep landscapes clean, otherwise, the information they hold may never be found. Landscapes have a large impact on the details archaeologists uncover about the people of the past. It is important society keeps this in mind, for there are many questions still left unanswered. These answers will never be found if trash continues to accumulate on Earth’s landscapes. This study was done to show how local preferences have a large effect on what landscapes are chosen for better future management and explains what characteristics of landscapes are ideal. This study was done to discuss the pressures of urban planning in rural areas, emphasizing the need to keep the natural landscapes. Beza, B. B. (2010, August 16). The aesthetic value of a mountain landscape: A study of the Mt. Everest Trek. Retrieved September 30, 2018, from https://www.sciencedirect.com/science/article/pii/S0169204610001490#! Rimrock view of Pueblo Bonito. For over 2,000 years, the Pueblo people occupied a region of the United States in the south western section sometimes referred to as Oasisamerica. 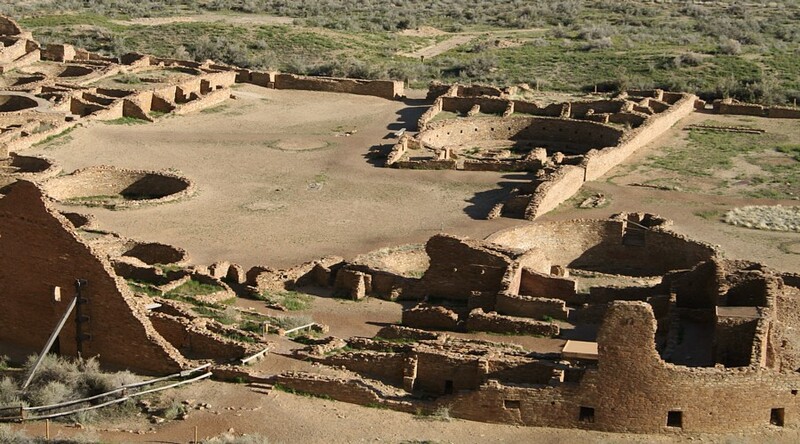 These ancient peoples built settlements, called Pueblos, with huge many roomed buildings and grand ceremonial plazas. Elaborate road- like networks connected the Pueblos, which extend east onto the Great American Plains. During this time Pueblo Bonito, Spanish for beautiful town, was built and used over a period of approximately 300 years, between 850 A.D and 1200 A.D. 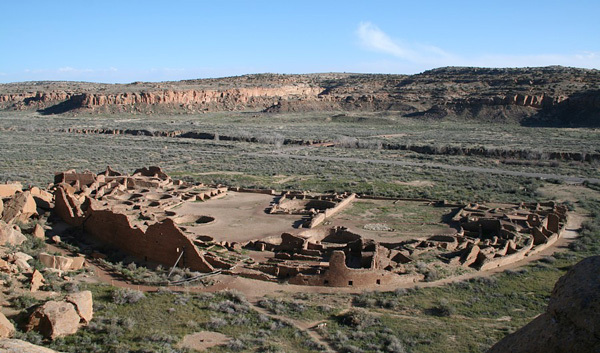 The site seems to have been evacuated around the end of 1300 A.D.
At the center of Chacoan society, Pueblo Bonito became an important ancestral site and one of the largest Great House sites in the Chaco Canyon region. This site is known as the main center of the Pueblos living in the region of Chaco Canyon. This archaeological site was actually found by a United States army lieutenant during a military expedition. Covering more 3 acres, this was quite an intricate setup. Pueblo Bonito has a semicircular shape, with clusters of rectangular shaped sections that were used as rooms for living ad storage. There are more than 800 of these rooms that are enclosing a central plaza. In this central section of the site, kivas were built. Kivas a chambers that are partially placed in the ground, for the purpose of ceremonies, such as contacting their ancestors or spirits. Near the center of the pueblo was a hidden chamber, six feet long by six feet wide, which was only accessible through a small hatch in the roof. Archaeological findings show a surprising lack of domestic activities in many rooms. There were 32 kivas built, and 3 great kivas, and with in those, there were evidence of communal ritual activities, such as feasting. This leads historical archaeologist to believe that the Pueblo Bonita held an important role in religious, political and economic functions within the Chacoan society. the larger Great Kiva adjoins the North-South wall to the south. I mentioned before that there were small hidden chambers found. 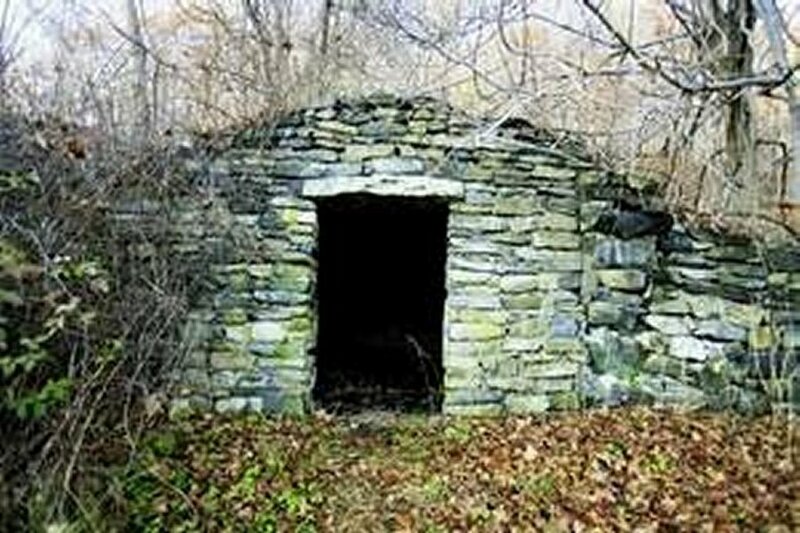 In one of these chambers skeletal remains were found. Excavation and DNA research tells us that over a dozen people were buried in here, and that they were most likely members of a powerful Native American dynasty, related through their mothers. We learned about this site and some of the other pueblo sites found in the south western section of America. I was very interested and wanted to find out a little more research about these sites, Pueblo Bonito in particular. Archeaology can tell amazing stories about the past that is not often told or written. This is very important because it can teach us important information, such as, how they kept unity, how and when religious practices started being used, diets that they ate. Basically how they survived and then we can learn off of the findings. This is the Teosinte plant and what Corn looks like now. Here is a chart of the corn broken down to show the differences. The picture has a chart at the bottom that describes it in scientific terms. 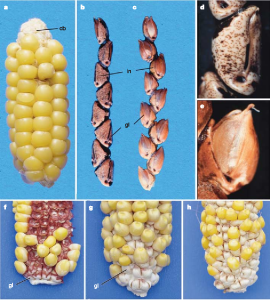 The first photo is what we know Maize (corn) to be today. The picture (B) is the grass seed Teosinte ear that has the rachis internode (in) and glume (gl) labelled. The picture ( C) is one of the first cultivations of maize and teosinte. 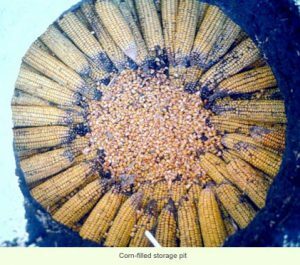 The picture (d) is the actual closeup of the teosinte fruitcase. The picture (e) is a closeup of the cultivation between the maize and the teosinte. The next three pictures at the bottom of the chart (f,g,h), show us what the tesonite glumes and internodes look like in the corn after all the cultivations. Wang, H.H., Nussbaum-Wagler, T., Li, B., Zhao, Q., Vigouroux, Y., Faller, M., Bomblies, K., Lukens, L., & Doebley, J. (2005). The origin of the naked grains of maize. Nature, 436, 714-719. Although scientists cannot say how long this cultivation process took. There is some archaeological evidence about how the corn plant completely lost its genetic diversity, which would mean a domestication event. 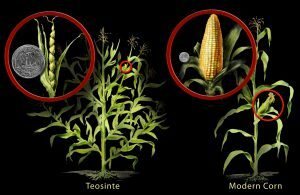 The scientists from the National Science Foundation, believe that it took around 3,500 teosinte plants to create the modern corn. 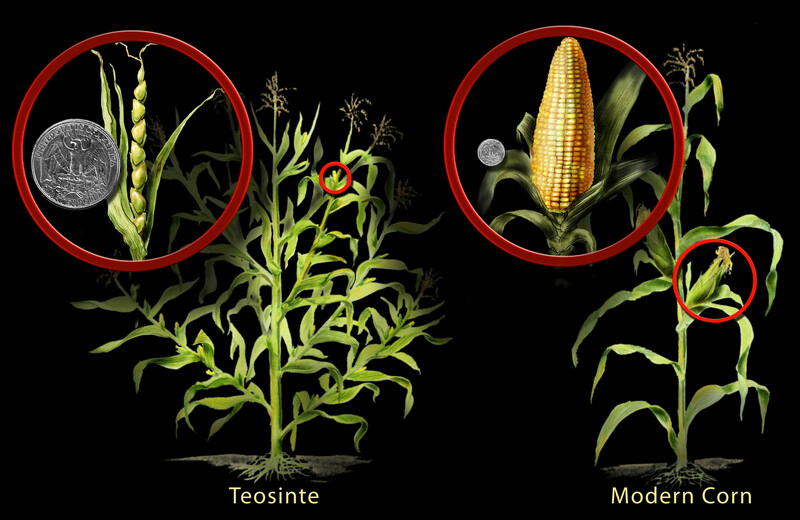 They figured out from this experiment that it took about 1,000 genes from the Teosinte plant to create the corn. (National Science Foundation, 2005) During this cultivation process, corn lost its survival ability in the wild. Native Americans made over 250 different kinds of corn, all different colors. (Hilarie, Larry, 1)Maybe these different kinds of corn are just what happened during different cultivations? Did the Natives like them enough to eat? A crucial part of human history is the development of taming animals to help in daily life, rather than as prey to be hunted or a predator to be avoided. 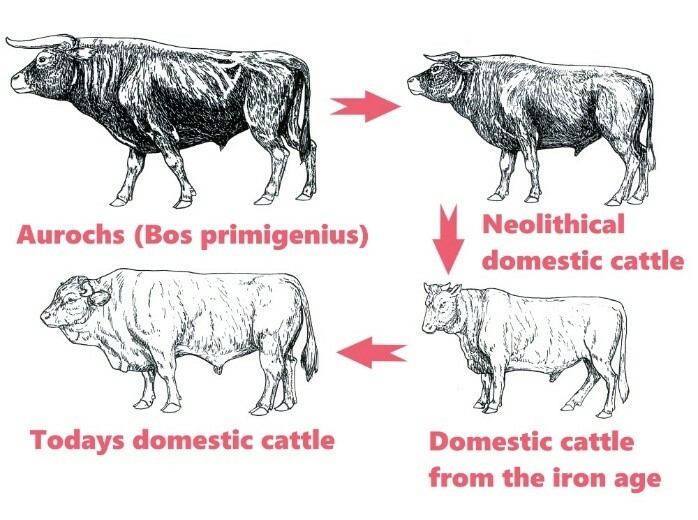 While the topic is not heavily focused on, domestication of animals was just as important as the domestication and farming of plants, because the animals were needed to be able to work the land and were a more reliable source of food than the harvest that may not come. Domestication happened at different points in all corners of the world, but animals were all domesticated for a reason, even if that is not their purpose now. Dogs were domesticated to assist in hunting, oxen to pull heavy loads, and farm animals like cows, horses, goats, and sheep for food and milk. While some roles are the same, dogs are no longer primarily used for hunting, horses developed into a means of transportation, and goats have recently been used to eat unwanted plants! Why wasn’t every animal domesticated? The animals that were domesticated usually had flexible diets that didn’t require much work on the human’s part, manageable temperaments, changeable social hierarchy, and would be easily bred in captivity. For example, it wouldn’t be very helpful to domesticate meerkats who have a strict social hierarchy and a specific diet along with a lack of purpose under human control. “Domesticated Animals.” Archäologisches Freilichtmuseum Oerlinghausen, Archaeological Open-Air Museum Oerlinghausen, afm-oerlinghausen.de/en/afm-rundgang-en/steinzeit-en/jungsteinzeit-en/haustiere-en#prettyPhoto. Domesticating a species involves human interference in the animals’ breeding patterns. Dogs were domesticated from wolves by selecting the wolf pups that were likely the least aggressive, most obedient, had smaller jaws, or a certain coloring depending on the culture that was domesticating them. This select breading has created the entirely new species of dog, separate from wolf. Domestication also affects the animals brought into human life. Archeologists can usually tell if certain animals are domesticated based on their bones Domesticated horses and cattle used to pull heavily loads for farm work often have osteoarthritis or leg strain that would not be there otherwise. Animal domestication changed a great deal of human society. It allowed for more permanent settlement as cattle provided a reliable food and supply source. With settlement and supplies came population growth and density and a development of communities that worked to provide everything needed for the people around, even if they weren’t of direct relation as was the previous custom. A downside to domestication was the spread of diseases between humans and animals that would have otherwise jumped between species. Pig flu and transfer of parasites are just a few examples of humans and animals getting a little too close. But without domestication humans may well still be wandering hunter-gatherers. Bahn, Paul and Colin Renfrew 2010 Archaeology Essentials. 2nd Edition Thames & Hudson —–x—-Inc., New York, NY. Lear, Jessica. “Our Furry Friends: the History of Animal Domestication.” Journal of Young Investigators, 17 Feb. 2012, www.jyi.org/2012-february/2017/9/17/our-furry-friends-the-history-of-animal-domestication. National Geographic Society. “Domestication.” National Geographic Society, 9 Oct. 2012, www.nationalgeographic.org/encyclopedia/domestication/. Pollen dating, is one of the lesser utilized methods archaeologists have to determine a relative chronology or timeframe for a certain event. Pollen dating can determine a relative time frame far earlier than radiocarbon dating is able. Although, because of influences such as pollen transportation by wind for thousands of miles and the abundance of certain kinds of pollen, radiocarbon dating is necessary to give absolute dates. Pollen dating is done by comparing the pollen zones in different rock layers or strata, comparing older, deeper layers to newer ones on top. The pollen zone is the particular time frame where specific species of plants release more pollen into the air than others. Using this, archeologists can determine climate changes, deforestation, or changes in the use of land hundreds of years ago such as the association between European settlement in North America and an increase in the amount of ragweed pollen found. Specific locations can even be determined as the origins for many rare or uncommon pollens. Pollen can come in a variety of distinct shapes and sizes depending on the plant it is coming from. These microscopic grains are incredibly sturdy with outer shells made from sporopollenin, an incredibly inert substance. This allows the pollen to stay intact for thousands of years, especially when preserved in bodies of water, peat or, lake sediment. Ireland’s bogs are full of sediments and pollen, with certain layers linked to events such as the eruption of Icelandic volcanoes in 1104, 1362, and 1510 and an agricultural shift after the Black Death. By looking at the sedimentary build up of pollen at the microscopic level, 400-1000x magnification, the pollen grains can be identified and the taxa concentrations determined, which can paint a picture of the climate as it changed over time. Pollen can also be collected from the inside of pottery such as pots and stone tools, trapped in the fabric of clothes, the the cracks of floors and walls, or on other archeological artifacts and features. This can be used to help determine the diets of a people, their crops, and the materials they used to build their homes. By looking at these specific pollen samples as well as the layer of accumulated pollen, researchers can develop a better understanding of the environment and biodiversity throughout the history of an area. Hirst, K. Kris. “How Does Palynology Inform Paleoenvironmental Reconstruction?” ThoughtCo, ThoughtCo, 8 Mar. 2017, www.thoughtco.com/palynology-archaeological-study-of-pollen-172154. “Picture Climate: How Pollen Tells Us About Climate.” National Climatic Data Center, www.ncdc.noaa.gov/news/picture-climate-how-pollen-tells-us-about-climate. The Irish Times. “Pollen Dating Paints Picture of Our Past.” The Irish Times, The Irish Times, 24 Feb. 2013, www.irishtimes.com/news/pollen-dating-paints-picture-of-our-past-1.365947. Recent research has shown that deep sea sediments are a likely sink for microplastics. 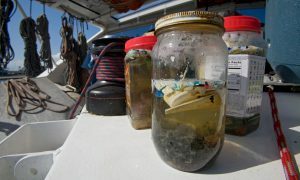 Studies in the Arctic Ocean, the Mediterranean Sea, and the Southwest Indian Ocean show an abundance of plastic debris. Deep-sea coring was used as a method of sampling. Since plastic is extremely durable, there is difficulty in disposing of the matter, which is why it accumulates in the natural environment. The plastic in the deep sea could have come from a multitude of origins; humans use plastic religiously. We have plastic in our computers, to carry our groceries, and in many other daily objects. 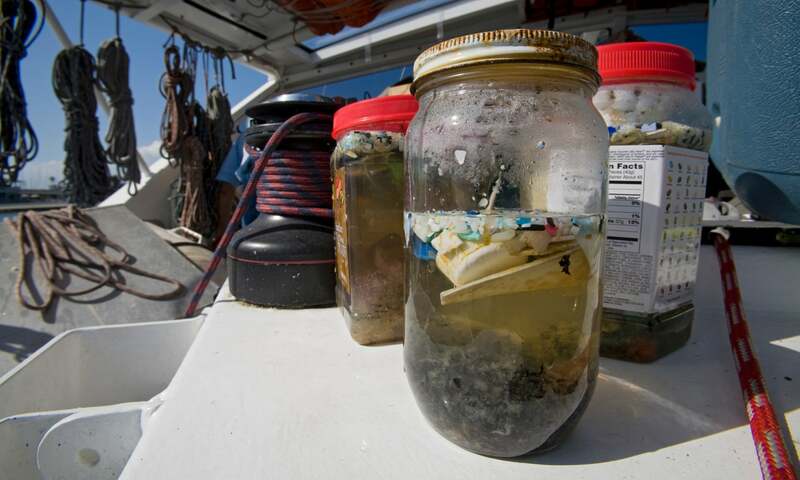 Other sources could be fishing waste, shipyards, or municipal drainage systems. The plastics could have travelled north by way of the ice floes in the Thermohaline Circulation, ocean circulation that is controlled by density differences. Microplastics have a smaller surface area than other plastic debris, so they are less buoyant, which makes them sink faster. Then, the plastics are deposited on the seafloor. Multiple research expeditions collected deep-sea sediment cores from basins, submarine canyons, seamounts (a submarine mountain), and continental slopes (the sea floor before the break of the waves). According to the article, The Deep Sea is a Major Sink for Microplastic Debris, “ten centimetre diameter cores were obtained from megacorers or boxcores that were subsequently subsampled.” Megacorers take wide samples in plastic tubes with a weight and suction system. Boxcorers take 600 millimeter square samples. In another study, scientists took samples by video guided multiple corers, which took eight cores. Multiple corers can take up to twelve undisturbed cores in plastic tubes. Coral specimens from different seamounts were also taken and observed. The different sampling methods proved to be most explanatory. According to Royal Society Open Science, “275 million metric tons (MT) of plastic waste was generated in 192 coastal countries in 2010, with 4.8 to 12.7 million MT entering the ocean” (Plastic waste inputs from land into the ocean.) The Royal Society Open Science also “confirmed that microplastics were abundant in all 12 sediment samples and all coral samples” and found that microplastics were found on every strata level ranging down to a depth of 3,500 meters. This prevalence of microplastic in all levels of their sampling and in all of the coral types sampled spanning many seas reveals that there is a great deal of plastic in the deep sea. The increase of plastics in the deeps sea negatively impacts shipping, tourism, and majorly affects wildlife. It affects many marine organisms by being taken in at the lowest level on the food chain. Microplastic “is of particular concern because it can be taken up by a wider range of biota (>172 species) and can be propagated in food webs” (High Quantities of Microplastic in Arctic Deep-Sea Sediments.) One of the most remote places on the earth, the deep Arctic sea, is being polluted by plastic waste. This is important to know and understand so that we can make reparations. Action must be taken to reduce our plastic production. “Seafloor Sampling.” Edited by Oceanography Center National, When Did Modern Rates of Sea Level Rise Start? | National Oceanography Centre, 2018, noc.ac.uk/facilities/national-marine-equipment-pool/scientific-engineering/seafloor-sampling. Eunomia, Research and Consulting. Eunomia Marine Litter. Human beliefs are always in constant change. Humanity’s growth is inevitable, and the more we evolve, the more our prior beliefs are challenged by new discoveries. Our technological advancements have aided in accelerating our growth. One of the most beneficial technological advancements for archaeologists was ability to produce absolute dates. These techniques have helped solidify our beliefs in human migration, as well as challenge them. By using dating techniques, such as radiocarbon and uranium series dating, archaeologists have been able to determine the span of time in which humanity began to spread across the globe. 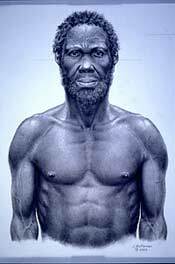 The beginning of humankind is believed to have originated in Africa. Then, some 60,000-50,000 years ago the exodus from Africa, also known as the “Out of Africa” expansion, began (Renfrew 134). 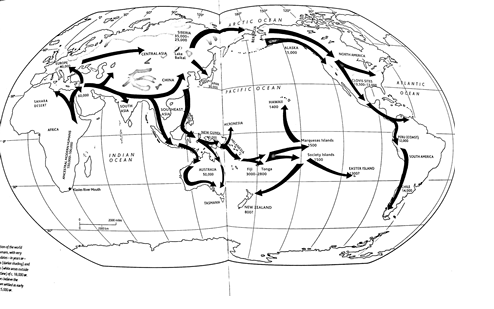 However, multiple recent discoveries have challenged these widely accepted dates of migration. In April of 2018, archaeologists from the Max Planck Institute for the Science of Human History in Germany discovered an 85,000 year old human finger bone in the Saudi Arabian dessert. This is the oldest human bone to be found outside of Africa or the Levant. Archaeologists used uranium series dating, which uses the radioactive decay of isotopes of uranium, to date the bone (Renfrew 127). Forty seven human teeth found in Fuyan Cave in Daoxian, southern China, were dated from 80,000 up to 120,000 years ago. Even more of this trend of discoveries have been made around the world, in Israel and Australia, which go against the textbook dates of world chronology (Flynn). These discoveries have created questions in regards to how the “Out of Africa” expansion took place. It was believed that the migration was done so in a collective way, however, these findings suggest the migration began 20,000-25,000 thousand years earlier than previously thought (Scott). The location of the bone, far into what was thousands of years ago a grassland, also indicates that humans had traveled much farther. Studies into this discovery also shows that humans migrated little by little instead of all together at once. These findings could even push back the date of Homo Sapiens evolution back even further. The world of archaeology is ever expanding; what seems to be a universal theory now can easily be replaced tomorrow. Advancements in technology will continue to aid in the search for new information. With every new update in equipment comes information we had not been previously able to obtain. “Earliest Human Remains Outside Africa Were Just Discovered in Israel.” www.smithsonianmag.com/science-nature/earliest-humans-remains-outside-africa-just-discovered-israel-180967952/. News Network, 9 Apr. 2018, www.cnn.com/2018/04/09/health/saudi-arabia-fossil-finger/index.html. Three fossilized hominid skulls were found near Herto, Ethiopia in 1997. The skulls were determined to be those of two adults and one child. The remains were too old to be dated using radiocarbon dating. In order to determine the age of the artifacts found at Herto (Figure 1), scientists performed argon-argon dating on volcanic rock that was found near the artifacts (Zielinski 2008). Figure 1. A map showing the location of Herto, Ethiopia, the village the hominid skulls were found near. There are multiple radiometric methods of dating artifacts. Some of these radiometric methods include radiocarbon dating, potassium-argon dating, uranium-series dating, and fission-track dating (Renfrew 2010:120-129). Potassium-argon dating, which measures the ratio of potassium-40 to argon-40, is one radiometric method, but this method of dating is not as precise as argon-argon dating. Scientists converted potassium-40 to argon-39. This allowed the scientists to use argon-argon dating. The volcanic rock analyzed by scientists at Herto were found to be around 154,000 to 160,000 years old (Zielinski 2008). The hominid skulls found at Herto are important discoveries because at the time of their discovery, they were some of the oldest near-modern human remains on record (Graham 2003). Based on archaeological artifacts like the ones found at Herto, artists have created depictions of near-modern humans (Figure 2). The Homo sapiens remains found at Herto, which were distinct from Homo neanderthalensis remains, were given a subspecies name, Homo sapiens idaltu. Other artifacts from the same time period were found near the fossilized skulls. Some of these artifacts include stone tools and animal bones with marks from tools. Additionally, cut marks on the skulls are indicative of the mortuary practices and rituals of the early humans (Sanders 2003). These marks and tools, which include hand axes, help the people of today understand how Homo sapiens lived over 100,000 years ago. Figure 2. An artist’s depiction of a near-modern human. Scientists claim the analysis of the Herto hominid skulls supports claims made by molecular anthropologists. Before the discovery of the Herto artifacts, molecular anthropologists have claimed modern humans evolved out of Africa (Sanders 2003). The discovery of near-modern human skulls in Herto, Ethiopia supports this Out of Africa hypothesis. Before the discovery of the Herto artifacts, other Homo sapiens remains had been discovered in Ethiopia and other African countries. The ages of these other remains range from 80,000 years old to 130,000 years old (Sanders 2003). 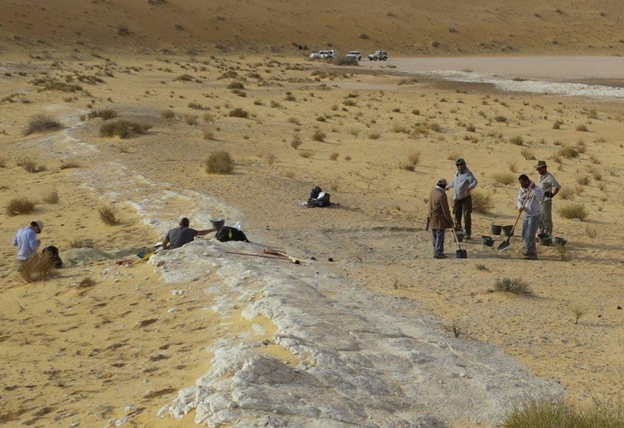 Since the discovery of the Homo sapiens idaltu fossils near Herto, remains found in Jebel Irhoud, Morocco have been found to be about 315,000 years old, making them the oldest Homo sapiens remains on record (Callaway 2017). While the Herto remains may no longer be considered the oldest Homo sapiens remains on record, the discovery was important in the understanding of the origins of Homo sapiens and illustrates the importance and usefulness of radiometric dating methods like argon-argon dating. https://www.nature.com/news/oldest-homo-sapiens-fossil-claim-rewrites-our-species-history-1.22114, accessed September 19, 2018.
https://www.scientificamerican.com/article/skulls-of-oldest-homo-sap/, accessed September 19, 2018. 2010 Archaeology Essentials. 2nd ed. Thames & Hudson, New York. https://www.berkeley.edu/news/media/releases/2003/06/11_idaltu.shtml, accessed September 18, 2018.
https://www.smithsonianmag.com/history/showing-their-age-62874/, accessed September 18, 2018.
http://news.bbc.co.uk/2/hi/science/nature/2978800.stm, accessed September 19, 2018.